That’s all it took for me to encounter 24 cars or trucks blocking bike lanes within Manhattan’s Sixth Precinct. So, counting time for paperwork, it would have taken me roughly an hour or two to write four times as many blocked bike lane summonses as Sixth Precinct officers have written all year. Let’s repeat that: Two hours of my time vs. 10 months of work by an entire precinct full of officers. Here they are: All the cars and trucks I photographed parked in bike lanes in the Sixth Precinct in 34 minutes. To all bike riders Reminder disobey pavement marking ride the wrong way disobey traffic control devices or you do not comply with any NYS vehicle traffic law WE WILL SUMMONS YOU ! I wasn’t the only cyclist offended by the tone of the precinct’s tweet; the blowback on social media was immediate. Cyclists pointed out that the unmarked car was, itself, parked illegally in the Citi Bike dock, that the tweet never revealed what the cyclist allegedly did, and that the all caps decree sounded more like intimidation than protection. And plenty of people pointed out the command’s horrible record on writing tickets to bike lane blockers and zero (yes, zero) tickets to drivers who block bus lanes so far this year. By comparison, the neighboring Ninth Precinct has written 49 bike lane and 20 bus lane tickets over the same period — it’s still not a lot, but the bike lane tickets represent more than eight times what the Sixth did. It’s appalling that officers under Capt. Robert O’Hare have shown such little regard for the mayor’s Vision Zero policy — especially given that 44 cyclists and 58 pedestrians have been injured by cars within the Sixth’s cozy West Village confines through September of this year. One pedestrian has died. Yet O’Hare’s cops have written just six tickets for blocking bike lanes. Now, to its credit, the city has installed many protected bike lanes in the neighborhood, so perhaps the better design means it’s reasonable that the Sixth Precinct has failed to write many summons to drivers who force cyclists into traffic, where they can be hit and killed. So I took a ride. 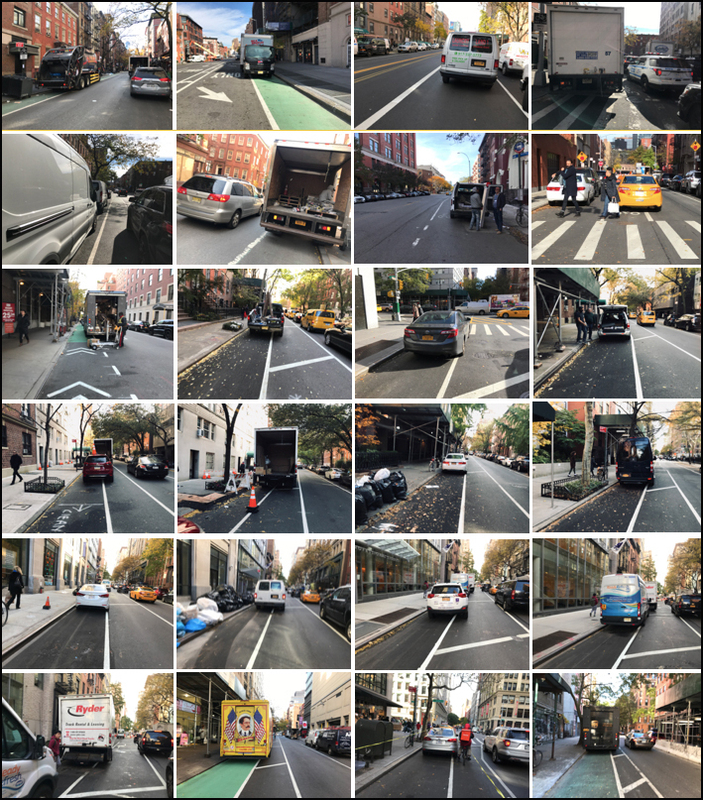 Within 34 minutes, I had taken 24 pictures of cars and trucks parked in bike lanes. So clearly, the Sixth Precinct could do more to bring these scofflaws to justice. Tweeting an all caps warning to cyclists — who have caused zero deaths citywide through September, compared to 145 fatalities caused by drivers — sends the wrong message. Or maybe it’s sending the very message that the NYPD wants to send. After all, cops are so notorious for their own bad driving that there are whole Twitter accounts like @placardabuse devoted to chronicling their offenses — so many accounts, in fact, that those Twitter accounts need their own Twitter accounts just to keep up with all the cops parked in bike lanes, in bus lanes, on medians, in crosswalks, in people’s driveways, at fire hydrants, under fake “no parking” signs, on sidewalks (many sidewalks), in handicapped zones, whole streets, and literally anywhere they damn well want. I asked the NYPD brass if the Sixth Precinct’s tweet met the agency’s high stated standard for courtesy, professionalism and respect, or whether a top official would talk to me about the Sixth Precinct’s failure to enforce bike lane parking, but no one got back to me. I even stopped by the Sixth Precinct station house on W. 10th Street to show Capt. O’Hare my pictures. He wasn’t available, I was told. His loss. If he had spoken to me, he might have learned how easy it is to protect cyclists from illegally parked drivers. It’s even easier than writing a nasty tweet. NYPD, the biggest gang in New York. The worst thing that ever happened to the NYPD was 9/11 and the billions of dollars in cash that fell on them. Like any gang, money makes it far, far worse. we will look back 20 years from now and truly measure the lack of humanity and destruction caused by the NYPD and their close brother in law, the district attorney. I’m willing to meet you halfway with regards to your outrage if you run a story about the threat cyclists are to pedestrians are when they ride their bikes on the sidewalk. Are there any bus lanes within the 6th Precinct’s borders? Off the top of my head, I don’t think so – the Broadway bus lanes start south of Houston Street, I think, and 14th Street is only just now having bus lanes installed. Can anybody confirm? It’s hard to fault the 6th Precinct for not enforcing bus lanes if there are none. 2) Install separate traffic signals for bikes which are flashing red or flashing yellow when motorists get a red. No need for to pass new laws for this. The NYPD just doesn’t get it. They’re going after the easy targets just to placate complainers and to fulfill (supposedly nonexistent) ticket quotas. I’ve always been puzzled by the idea that sidewalk cyclists are some sort of existential threat to pedestrians given that we allow children under 13 to ride on sidewalks. Why does reaching your 13th birthday suddenly make you dangerous to pedestrians? Either we should allow everyone to ride on sidewalks, or if it’s really so dangerous, allow nobody to ride on them. In my experience there seem to be only two groups who cause major issues riding on sidewalks. The first is delivery people who might ride their e-bikes at 20 mph. The second is older kids, but perhaps still under 13, who race along sidewalks. The real problem is excessive speed and reckless riding, not the act of cycling on a sidewalk, which is potentially dangerous. Maybe the law should be revised to allow sidewalk cycling unless otherwise posted. Places where it could be prohibited include already crowded sidewalks, and streets which have a protected bike lane. In the outer boroughs lightly used sidewalks, particularly the wider ones along arterials, can serve as defacto protected bike lanes for slower, timid cyclists who really don’t threaten pedestrians. Faster cyclists in general won’t want to ride on sidewalks anyway. Nobody is interested in meeting you half way. Fair enough then you won’t mind me continuing to call out rogue cyclists on the sidewalk that threaten my safety and the safety of my dogs in the same manner that cops in bike lanes threaten my safety when I riding. Cyclists on footpaths represent f*** all risk to pedestrians. So it’s ok to park in a bike lane? Weird logic. While it wont address all vehicles parked in the bike lane, I think a good solution to deal with taxis parking in the bike lane, is to record the vehicle themselves, and showing their license plate and submit it to 311 as a Taxi Complaint. In my experience, the taxi driver will get cited and fined, especially if you have video proof. You can use your phone or you can invest in an action camera. I picked up a GoPro Hero5 Session for about $175 and its got some good video quality. Yes it can be a big investment for some, but there are benefits to having an action camera on while you bike. I recently witnessed a car run the red light in Sunnyside, I have it recorded and tweeted the video to the Precinct to see is they can issue a summons to that person. Its been almost a week and they havent responded yet. I understand that cops cant be everywhere, but if I have definitive proof of a car running a red light and their license plate, I do not see why they cant issue a violation. “Halfway” wouldn’t be fair, considering that the threat by motor vehicles is about a thousand times greater than the threat by bikes. In many places in Europe there are marked bike lanes on sidewalks. It greatly increases safety for cyclists to eliminate many of the conflicts with vehicles. If the marking is clear, pedestrians know where not to walk. Where do you think you live? The English countryside? Speaking of “weird logic”, who ever said that? The separation looked like a much smarter overall design. The best sidewalk bike lanes I saw were in Iceland. They were laid out as 2 way bike lanes and wherever pedestrians needed to cross them for example to get to a curbside bus stop – there was a clearly marked pedestrian crosswalk across the bike lanes. Thank you for this. Excellent reporting. Love the photo grid. Funnily enough, I actually work in the English countryside.